This 210 MM German Howitzer sits on a brick base in a grassy area. In front of the cannon sits a marker with an inscription that details the importance of the cannon and the memorial as a whole. Originally the cannon was placed to honor those from the community who served in World War I. Later, it was rededicated to honor all veterans from the area who served their country. The rededication of the cannon is noted on a metal plaque that is in the bottom right corner of the marker. ERECTED BY HICKORY / AMERICAN LEGION / POST NO. 48 5-30-27. 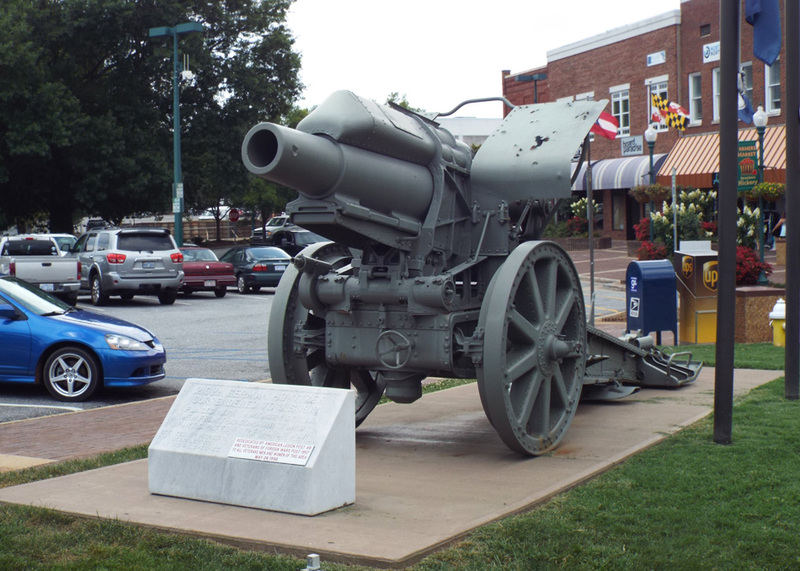 The cannon was erected and dedicated on May 30th, 1927 after the Hickory American Legion Post 48 and the city of Hickory funded $200 for the shipment of the cannon. The cannon was shipped to Hickory from New Jersey. On May 24th, 1998 the cannon was rededicated by the Hickory American Legion Post 48 and the Veterans of Foreign Wars Post 1957. 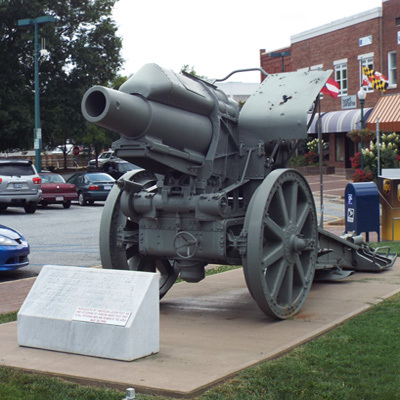 In 2012, the cannon was refurbished and repainted by Hickory’s public services department. The memorial is located in the downtown area, in the west end of Union Square, between Main Avenue Northwest and a large brick plaza. A short distance east is the Tower of Miracles. Several blocks away on 2nd Street SW is the Old Hickory Tavern memorial. The memorial stands on a pedestrian plaza, surrounded by a small lawn. The memorial originally sat in Union Square, but was then moved to a grassy area by N.C. 127 in order for the streets of Hickory to be redesigned. After 22 years at this location the memorial was moved to the east side of downtown. Forty eight years later, it was moved across the street from the Ivey Arboretum.